The surest way to build a landscape of native plants is to look at where they came from. “With our sixty-five mile-per-hour lifestyles, we have forgotten how to look closely,” explains Rick Huffman owner/principal of Earth Design, an environmental landscape design business in Pickens, South Carolina. Where did all of this love of nature come from? Like many people, a family member opened his eyes to the wonders of nature. Huffman’s grandmother was his catalyst. She took him hiking through woods and fields. He grew up loving the wilds and seeing beauty in the natural world. Protect the wild areas. Sustainable gardening is all about “being in tune with the world around us,” Huffman points out, “Once you have lost it, you forget what it looks like, and the next generation will never know it.” Don’t be tempted to dig a plant from the wild. Very often, they just don’t survive. It is also illegal to remove threatened or endangered species. Be responsible and buy from reputable dealers. Small yards and busy lifestyles combine to keep many people from enjoying their outdoor spaces. Growers are aware of this and are busy indulging our gardening habit, offering many choices to fit shrinking gardens. 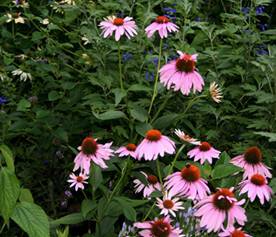 Choices available to you include native plants that help build the perfect backyard environment. Making a difference starts with one person and an idea. Plant trees to clean the air. Plant native grasses and sedges to clean the water. Plant flowers to feed the pollinators. One person can make a difference.